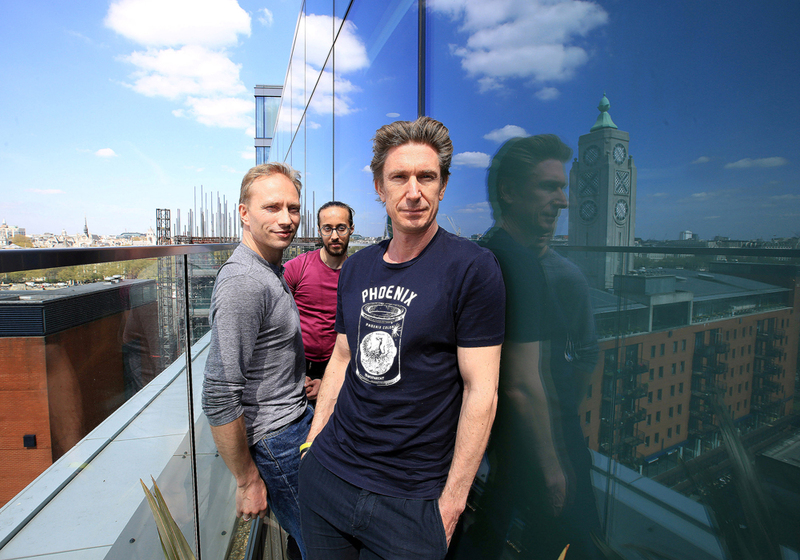 Co-founders of sweatcoin (L-R) Oleg Fomenko, Ranbir Arora and Anton Derlyatka pose for a photograph at their office in London, UK. A couple of Russian entrepreneurs have launched Sweatcoin, an app which earns the user virtual money for walking. For the moment, the app is only available in the United Kingdom. Russian entrepreneurs Anton Derlyatka and Oleg Fomin launched the Sweatcoin app in the United Kingdom earlier this year. Users can earn money, counted in “swc” units, for every step walked. A person must take 1,000 steps to earn one “swc.” With this money, goods and services can be bought on the app’s e-commerce platform; everything from sports attire to footwear and even a session with a personal trainer. Fomin said Sweatcoin’s advantage over competitors and trackers lies in its more precise step count. The algorithm, together with GPS and other statistics, guarantees transparency and prevents users from fabricating steps. In the first round, business angel funders invested around $900,000 in Sweatcoin, which has more than ten partners. These include British suppliers of sports goods and services, such as Vivobarefoot, BoomBoom Athletica, and Fitbug. Sweatcoin’s developers eventually plan to trade the “swc” on stock exchanges, along with other virtual currencies. The service for now is available only on iPhones in Britain. Fomin said the UK was not chosen at random. The country has an obesity problem, and its citizens are not indifferent to the issue of a healthy lifestyle. The developers plan to launch the app for Android users in the near future, and to enter the U.S. market. The idea of making money on the move has inspired others to copy the Russians. The British BitWalking company, for example, has plans to launch a similar app. Internet investors share Fomin’s optimism about the future of virtual currencies. Sweatcoin secured an additional $600,000 from investors in early 2016, to add to the $900,000 from the first round of angel funding. Sweatcoin, unfortunately, is unlikely to appear in the developers’ homeland. The Russian Central Bank has banned money surrogates, like as bitcoins and other crypto-currencies. These services won’t be able to offer Russian users their own currency in the form of bonuses, such as in Europe. Alla Savchenko, head of product development at Yandex.Money, said many companies already reward users for certain activities by using money surrogates. One example is bonus programmes offered by airlines allowing Russian travellers to pay for flights from miles already flown. Savchenko pointed out, however, that there is a clear difference between loyalty programmes offered by companies registered in Russia, and virtual currencies that exist outside of a specific national jurisdiction.